Finland’s Nokia may not be a huge presence in the U.S. smartphone market, but the company is still by far the world’s largest maker of handsets, and a lot of that strength comes from developing and emerging markets. To that end, Nokia today announced four new C-series mobile phones that are designed to provide affordable and flexible ways for folks to communicate. 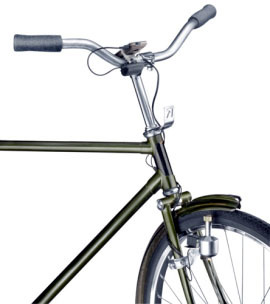 However, Nokia also took the opportunity to introduce the Nokia Bicycle Charger Kit, which enables users to charge their mobile phones using a simple dynamo connected to a bicycle wheel—a great solution for green commuters and outdoor enthusiasts, as well as a charging solution for folks with limited access to electricity. 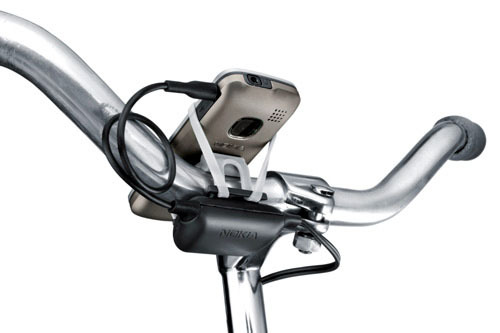 The kit attaches a dynamo to a bike’s front wheel, with a wire leading up to a mounting bracket that hold the phone on a a bike’s handlebars. The movement of the wheel spins the dynamo, which generates power and can charge any Nokia phone with a standard 2mm jack. The amount of power the system generates depends on speed: the faster a person rides, the more quickly a phone will charge, but a user shouldn’t have to go more than 4 or 5 mph to generate enough current to charge a phone. Nokia plans to offer the Bicycle charger kit both online and via “branded retail”for about $20…although if that means Nokia stores, U.S. customers might be almost out of luck. Nokia also announced the C2-00 handset, which offers a dual-sim capability with dual standby capacity, meaning both SIM cards can receive calls and text messages at the same time. One SIM is under the batter, while the other is hot-swappable, enabling users to insert and remove cards as necessary to take advantage of different rate plans or more easily move between countries. 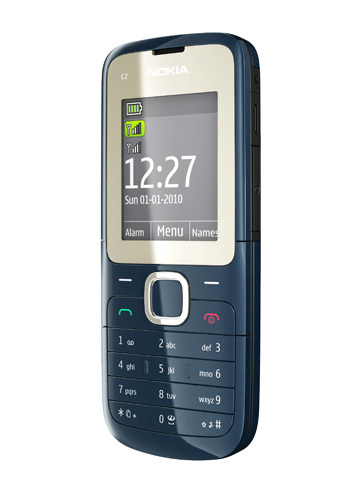 The C2-00 will be available for about €45 towards the end of 2010.